Create, Manage and Analyze the evidence with the creation of the case. Add Multiple SQLite Database within the case. Export carves evidence into various file formats PDF, CSV and HTML. Allows database indexing option for large amount of data. View Table Records, Views, Triggers. Simple color schema for unallocated space, deleted data, normal data and secured deleted data. The case is created for better investigation of the sqlite DB file. Single case has a capability to add a multiple sqlite database file that's why the case management option play a crucial role in SQlite browser forensics. With the use of sqlite forensics browser tool, in single case multiple custodian entries allow to investigate data at a time. This option is specified in sqlite database browser to ease the forensics of sqlite database. In sqlite database forensics examiner performs quick scan on DB file and show the preview of scanned file in various views such as property view, hex view and deleted view. Meanwhile, custodians also provides previews within blob data such as video & images. The forensics of sqlite database offer to open DB files as well as a preview of its data items such as table record, view, trigger, classes, etc. Even with the help of sqlite browser forensics tools, investigator easily examine a data in multiple file formats. The Sqlite Forensic Explorer Tools powerful database view reflects the real artifacts of a DB file in simple color schema for the deleted data, normal data, and secured data and unallocated data. With the help of sqlite forensics tool, the investigator can apply advanced search within the scanned file to produce a more accurate result as well as here you have a freedom to examine any size of data. Indexing feature of the Sqlite Forensic Analysis Tool has now been made smarter that allow data indexing for large amount of data which ease the task of Forensicator while carving evidence. While exporting evidence the tool support forensically sounds format such as PDF, CSV and HTML. 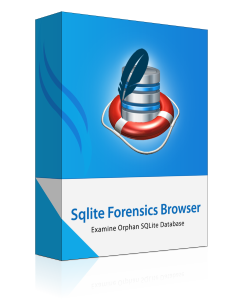 Demo version of SQLite Forensics Browser software preview all sqlite database file. Is it possible to privew all the data items of sqlite database? Yes, the tool will let you preview all of the table record ,triggers, etc. What maximum DB file size does the tool support? There is no such restriction imposed by the tool while to examine DB file. We are extremely happy to share our satisfaction with the sqlite forensic browser tool team that the process was easily carried out with the tool., it was great for to develop tool that could cover up the need of forensicator while investigating a sqlite browser database. There are plenty of DB file that had to be investigate without any problem.Thanks to sqlite forensic browser tool which helped me to open and examine within sqlite browser database.